Lazy Vegans vs Athletic Meat Eaters. Who Is Healthier? I personally think debating the health benefits of going vegan is pointless. You go vegan because you care about animals. Any health benefits are just side effects of doing the right thing. That being said there are a lot of people who don’t care at all about an animal, but they will change their diet if they thing it will help their health. And since that saves animals, I’m all for it. The results of this study are just phenomenal. What if we compared the arteries of marathon runners to couch potatoes? You would predict the athletes to have better artery health right? 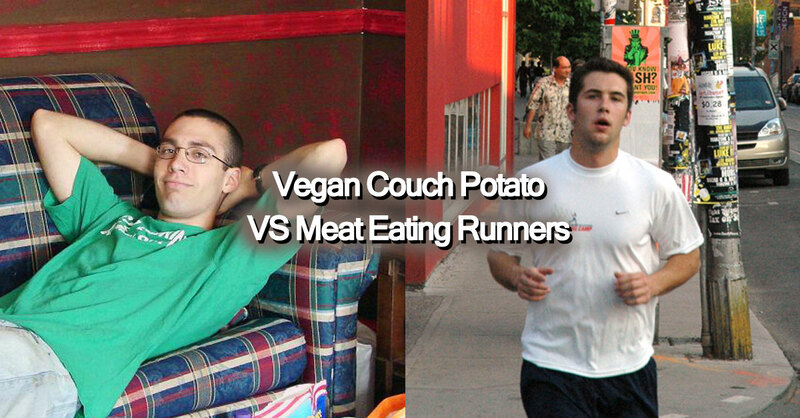 But what if our couch potatoes were Vegan and our marathon runners were meat eaters? That’s where things start to get interesting. This is a powerful testimony to the health benefits of a Vegan lifestyle. The results of this study will shock some so called ‘experts.’ You can watch this fascinating video on the next page. Once you start watching you won’t want to stop. And what about us vegan athletes?! Plant strong, baby! This was not vegan vs meat this is vegan vs ‘standard American (crap) diet.’ Also where is the data about what the vegans ate? There are vegans who eat fairly well and those who eat close to a standard American diet full of grains, preservatives, hydrogenated oil, etc. It would be interesting to see the results from people who eat proper organic grass fed beef, wild caught seafood, and pastured pork/poultry. People who eat conventional disgusting meat get way to many omega 6’s. People eating the standard American diet are also consuming all sorts of other bad stuff like hydrogenated oils, msg, dyes, GMOs, and preservatives. If vegans wanted to prove something they should look at people who eat pasture meat, pasture eggs, butter, no hydrogenated oils, plenty of fruits/veggies, and ferments. Yes, “standard American diet” is terrible for you, any average person that eats well and exercises will be much healthier than any couch potatoe, while you don’t need meat, it is very healthy for you, as long as it’s good quality. I think a more interesting point would be trying to differentiate between the health issues of eating organic grass fed meat vs any other kind of meat. If you looked at the research about what what it is in meat that causes the health issues you would quickly see it has nothing to do with whether the cow ate grass or not. I would post many links here for you to look at but I can tell from your comments your mind is settled on the matter. And that is fine you are certainly free to enjoy your own opinions no matter how wrong or misguided they may be. Like it or not, the research on a diet with meat vs a vegan diet is long standing and clear. There is no debate among anyone who actually looks at the research. Thanks for stopping by the page. Where is the data about what the vegans ate? That was the golden question here that people seem to be ignoring. Vegan is merely a label. You stay away from animal products, that does not mean the diet is automatically healthier. Many of my vegan brethren gorge on Oreos, chips and many other cancerous processed foods. We need to be careful in discerning what both diets consist of to be accurate in our assertions. Also: movement is an essential part of living in the American lifestyle whether you are eating animals or not. Probably as ridiculous as saying vegan couch potatoes are healthy. I am not grasping at straws sir or madam and don’t need too. I am not against veganism in the slightest. Many feel that just avoiding animal products is enough and several do not know that is false. You clarified the diet here is intended to be plant based, and that’s all I cared about, so thank you. No one said couch potatoes were healthy. It compared the heart health of vegan couch potatoes to the heart health of SAD runners. The level of comprehension here leaves a lot to be desired. Some days I wake up and wonder why I do this page at all. seriously. Awww, you’re emotional. No need. People are going to challenge your assertions if there are valid reasons; that is how clarifications happen. The title is misleading and can be interpreted a myriad of ways, if you posted it then deal with that responsibility or perhaps you shouldn’t do public pages. The ones who resort to personal attacks seem to be lacking that type of understanding. People are questioning the study. No one questioned your individual intelligence. Not initially anyway. I would like to see some data, the “typical diet” leaves a lot to be assumed. I think the point of this article was to point out that eating meat is actually unhealthy, not healthy, and that is pretty clear looking strictly at science. No, lol, first, eating meat is not unhealthy, and the article simply claims that the “standard American diet” is bad, which it is. Looking strictly at science, meat is very healthy, tons of amino acids and animals fats. If you look at selective stats then it’s healthy. If you look at actual studies done by actual doctors not funded by the meat industry it’s abundantly clear that meat is bad for you. But that isn’t why Vegans are Vegans to begin with. It’s just a really nice side effect of being Vegan. Actually, if you look at actual studies, it’s very healthy. I would list 100 studies for you here. But Im tired and it’s very late. There would be no convincing you because you want to eat meat. So it would be a waste of my time. Live long and in good health sir. I would list a million lol. I eat very little meat, but if the quality is clean , it is very healthy. Just look at the evolution of humans. I wasn’t being passive aggressive. I was being aggressive. This is a page for Vegans. If you don’t like Veganism, or Vegans or the posts we make here you are welcome to move along. I didn’t create this page to debate people. I created this page to inform vegans about things they care about. Nutrition, recipes and vegan news. So please, pack up your things and quietly exit please. I am not threatened by anyone. There are a ton of paelo pages you can go interact with and they would love to have you.